Tupuji Imere's have taken back their position in the top 5 of the PVFA classment after their win over Spirit 08 this afternoon at the PVM Stadium. The win puts them at the 5th position again over Yatel who have lost their position and now down to 6th place after their loss to Amicale. Amicale is still leading the PVFA classment with 33 points after their win today. Tafea F.C. maintained their 2nd position with 23 points and Spirit with 19 points. Spirit's position now is at risk after their loss to Tupuji Imere this afternoon. Academy has 16 points and in a good position to progress over Spirit if they had not cancelled their match. Westan and Seveners United F.C. still down the bottom of the classment with 9 and 10 points. Academy and Westan Match Cancelled due to bad weather. The 3rd match this afternoon between Academy and Westan was cancelled due to bad weather. The PVM Stadium was so soaked that match officials called off the last match. Rained poured yesterday night and continued again over Port Vila today. However, it could not stop the first two matches which saw Amicale wiping out Yatel F.C. with 7 goals to 0 and Spirit 08 surprised by Tupuji with a last minute goal by Coulon from Imere. Amicale side have proofed again to their supporters this afternoon that they are unbeatable, when they thrashed Yatel by 7 goals to 1 at the Port Vila Municipal Stadium. Although the weather was not pleasant for players and fans, more than 3000 football fans came to watch the game which some have described as an exciting one. Yatel open the score 7 minutes in the first half with a goal by Jessy Frederick. Amicale equalizes after 40 minutes and advanced their goals the rest of the match. End of game, Amicale 7 and Yatel 1. Jerry Shem - 67" 2 goals. 2nd goal time not recorded. Roger Waiwai – time not recorded. Batram Suri creates victory for Amicale F.C. today by shooting the only victory goal for their match against Spirit 08 F.C. at the Port Vila Municipal stadium. More than 4000 spectators have packed the stadium to watch the match between the two rivals Amicale and Spirit 08, both teams are at the top of the Port Vila Football Association (PVFA) table. It is obvious that a lot of football fans have come to watch the two teams perform. The two teams made history this year when they import players from Fiji and Solomon Islands to boost their strength. The changes have pushed both clubs to top of PVFA table. It was a fierce match between the two clubs and an unpredicted game too. Fenedy missed some very good opportunities today. Spirit 08 looks solid too with their defence and an active striking force in which at some instances has panicked and creates errors at Amicale base. The only goal of the match came after a free kick awarded to Amicale outside the 20 metre box and Robert Yalu chipped the ball over Spirit 08 wall that cause chaos at Spirit’s defence. It was when Batram had the opportunity which he took with no mistake but send the Amicale’s celebrating. The other two matches saw Academy beat Tupuji Imere F.C. by 3 goals to 1. Nemani Rogara scored 2 goals for Academy and Simo scored 1 goal. Tafea F.C. took Yatel F.C. in the final game of the day which they smashed the blues with a come back 4 goals to 0. Richard Iwai open the score 30 minutes after first half and the rest of the goals by Sakama. Sakama missed some good opportunities too. Tafea F.C. Vs Yatel F.C. Live on web now! 1" Shot by Sakama went wide. Tafea's 15 jersey was denied entry by defence to a corner kick. Shot cleared out. 2" Crossing by Richard Iwai to Yatel's box and foul against Yatel. 4" Yatel 9 jersey booked for foul play against Tafea's defence. 6" Corner kick taken by Yatel cleared by Tafea's defence. 7" Free kick by Freddy Vava 20m from the box was cleared by defence. 11" Good crossing by Ettiene but chance to take shot was missed by Tafea 19 jersey. 17" Shot by Yatel was caught by Tafea keeper. 18" Good low crossing by Rihard Iwai to Tafea 15. Shot was deflected by defence and another shot by Tafea 19 was deflected over the bar by Yatel keeper. 22" Free kick by Yatel 20m from the box was missed by Tafea keeper but fortunately Freddy Vava was there to stop the ball. 25" Good opportunity for Tafea 19 but was headed wide. 28" Good crossing by Richard Iwai to Ettiene but shot was deflected by Yatel's defence. 30" Great pass from Tafea 15 to Richard Iwai. Yatel keeper could not stop the powerful shot from Richard. First goal for Tafea. 32" Corner kick by Tafea was cleared by defence. 35" Yatel 8 injured. Ettiene booked for foul play. Free kick awarded and taken by Yatel 5 was saved by keeper. 42" Foul against Yatel 8. Nice free kick by Yatel went over the bar. 44" Substitute for Yatel. Another free kick for Yatel but shot cleared by Tafea defence. Tafea F.C. 1 - 0 Yatel F.C. 53" Free kick awarded to Yatel 1m from the box but shot wide. 55" Substitute for Tafea. 15 out Jeffery Gete (17) in. An opportunity for Yatel was tapped out by the keeper. 63" Ettiene's shot was saved by Yatel keeper. 66" Substitute for Yatel. 18 in 9 out. 67" A cross from Ettiene was deflected to corner. 68" Richard Iwai took the shot but was cleared by Yatel defence. 68" Substitute for Tafea. Ettiene(11) out and 12 in. 69" Another corner kick for Tafea. Sakama scored!. 70" Another great pass from Tafea 19 to Sakama and he scored again. 72" Substitute for Tafea. 16 in Richard Iwai out. 79" Sakama scored another goal for Tafea. 88" Yatel defender (5) injured. Goal by Sakama dismissed by referee. 84" Shot by Sakama went out. 85" Sakama chipped ball over defender 1 but was deflected to corner by defender 2. 87" Sakama's took one shot but the ball went over the bar. Tafea F.C. 4 - 0 Yatel F.C. Amicale F.C. Vs Spirit 08 - Live on web Now! 4" Fenedy before the keeper but ball caught. 8" Seimata brought down, free kick for Spirit 08. 9" Seimata down again 15m from the box. Another free kick and deflected by Amicale's wall. 10"Fenedy with the keeper but shot went wide. 12" Robert Yalu down. Free kick for Amicale. Good pass to Fenedy, shot went over the bar. 13" Foul play against Fenedy. Free kick awarded to Amicale 20m from the box. shot was cleared by Esava. 15" Error by Amicale defence and corner kick was cleared by defence. 18" Another opportunity for Fenedy was cleared by Esava. 20" Free kick taken by spirit to find 11 jersey but ball went out. Good pass by kidston to Batram was caught by the Spirit keeper. 22" Shot taken by Spirit's 11 jersey went over the bar. 24" Great shot by fenedy was saved by Spirit keeper. 25" Fenedy missed another opportunity from Batram. 28" Good pass to Fenedy with a hat-trick on the keeper but was cleared by Spirit's defence. 31" Batram brought down in the penalty box. 34" Great play by Kidston, Batram and Robert Yalu, but cleared by defence. No chances for both team yet. 41" Good try by Amicale 21 Jersey. Another good opportunity for Fenedy caught by the keeper. Spirit defence looks solid with Esava Samudere and Richard is enjoying the game as usual. 47" Foul to seimata. Free kick clearedn by defence. 49" high pass by 11 jeresey was intercepted by Amicale keeper. 50" Yalu went down. Free kick 20m was hit out by Spirit keeper. 53" Good crossing by Spirit 9 jersey was intercepted by goal. 57" Foul to Richard 20m from box. Free kick by Fenedy was shot wide out. 61" Crossing by Batram to find Billy Kidston was cleared by Spirit defence. 63" Powerful shot by Spirit was deflected by defence. 68" Substitute for Spirit. 11 out and 18 in. 71" Richard Anisua booked for foul play. 78" Both team working very hard. Substitute for Spirit. Seimata Captain out. 79" Corner kick by Amicale cleared by Spirit defence. 81" Spirit 9 jersey booked for foul play. 83" Substitute for Amicale. 12 out 31 in. 84" Free kick by Amicale Yalu deflected by Spirit's wall. Another free kick chipped over by Yalu and was shot in by Batram Suri. 88" Substitute for Amicale. Batram out, 17 in. Esava moved to striking position. Amicale F.C. 1 - 0 Spirit 08. Academy Vs Tupuji Imere F.C. - LIVE now! Penalty awarded to Tupuji was shot over the bar. 30" Substitute for academy and Tupuji. 31" corner kick by academy and was chipped over the bar. An opportunity for Tupuji was shot wide. 34" Namani brought down by Tupuji defence. No penalty. Academy 3 - 1 Tupuji Imere F.C. Referees should prepare to apply correct laws at the right time. “Referees should prepare to apply correct laws at the right time during a match”, said Mr. Harry Atisson, member of the OFC and FIFA referee committee. He made these comments over last weekend’s clash between Amicale F.C. and Tupuji Imere when the referee’s decision during the match infuriate the Tupuji Imere supporters who got in a row with the match officials, at the Port Vila Municipal Stadium. It started when a Tupuji player got red card for foul language. The referee’s decision was disputed by Chikau Mansale and he got booked for arguing with the referee. In another incident, Tupuji captain was also sent out for intentionally deflecting the ball by hand which should have been a goal chipped past the keeper by Fenedy from Amicale. The referee’s decisions that afternoon raised commotion amongst football fans and especially fuming Tupuji Imere’s officials and supporters. It is clear that the referee made his decisions because Tupuji players used foul language during the match. Tony Chilia and another Tupuji player used foul language in 2 incidents during the game. According to FIFA Law 12, A player shall be sent off the field of play and shown the red card, if, in the opinion of the referee, he: (n) is guilty of violent conduct;(o) is guilty of serious foul play; (p) uses foul or abusive language; (q) is guilty of a 2nd cautionable offense after having received a caution. Meanwhile, FIFA has approved 7 Vanuatu referees to officiate football matches in 2010. 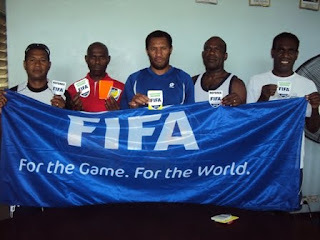 Reports received from the VFF referee department this week that FIFA has approved Soterio Bernard from Luganville Football Association, Banga Robinson and Bruce George from PVFA to be FIFA referees in 2010. Assistant referees are Mahit Chilia, Alick Lukai and Michael Joseph from PVFA. Peter Pakoatong is the FIFA futsal referee. Harry Atisson, who is a member of the OFC and FIFA referee committee, has put on a lot of effort in developing these referees in Vanuatu and has praised them for their achievement. “The referees have proofed themselves and through their dedication with the PVFA in the past years, I think they deserve the promotions”, said Mr. Atisson. “Now they need to work extra hard to apply good rules and uphold fair play to avoid confusion in their decisions during a football match”, he added. The newly appointed FIFA referees are taking referee trainings every week at the Port Vila Municipal Stadium. Vanuafoot this week has entered a new chapter in media or information dissemination to grassroots when it started broadcasting a new program on Radio Vanuatu's Paradise FM. 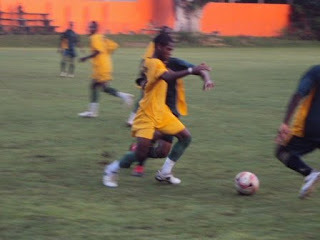 Paradise Football News is a program that will feature football developments in Port Vila, Oceania and around the world. Vanuafoot media officer and producer, Mr. Harry Atisson, in a statement yesterday at Paradise FM studio, thanked Radio Vanuatu and Paradise FM for recognising the importance of the sport in Vanuatu. The program was presented yesterday morning with the Paradise FM crews. "The program was really informative and it went out there for Port Vila to taste", said Mr. Atisson. "Football is the No.1 sport in Vanuatu and our aim is to get the information out there and which should help in a way or another to bring people together, educate and make everyone happy", he added. 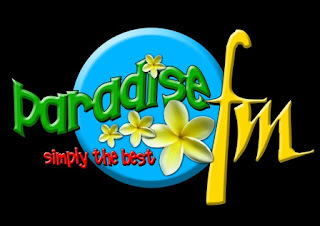 Paradise Football show will be broadcast around Port Vila on the FM 98 frequency 10 minutes every day from Monday to Friday at 9 oclock in the morning. 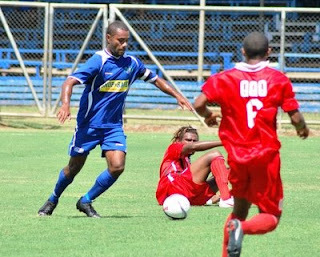 An impressive 3-0 victory for Lautoka over Marist at Churchill Park today has seen the Fijian club champions leapfrog Hekari United and Tafea to go top of Group B in the 2010 O-League. Osea Vakatalesau put the home side ahead after just eight minutes before Alvin Avinesh and Jone Vonu Junior assured the victory with a goal each in the second half. Lautoka now have nine points from their four matches with Hekari and Tafea both on seven points while Solomon Islands representatives Marist FC are still yet to pick up a point in the competition. With just two match days left to decide the O-League finalists, Lautoka coach Imdad Ali says he is pleased with how his team is placed. "I am happy with the win because it keeps us in contention for playing in the home and away O-League final," said Ali. "We missed a lot of chances in the game and should have scored more but I am pleased with the result." Tafea’s hope to win and continue to lead in the O-league Group B this season has diminished in the horizon when the Vanuatu club champion were thrashed by Hekari United in an unprecedented moment with a score of 4 goals to 0, at the PMRL stadium in Papua New Guinea yesterday afternoon. Hekari United look solid after they signed in 5 Solomon imports. Internationals Henry Fa’arodo, Gideon Omokirio, Stanley Waita, Alick Maemae and Eddie Ngaitin slipped in just before the second half of the O-league 2010 starts. According to an Oceania football online poll, many have voted Tafea to win the O-league this season, but the loss yesterday was not what is it anticipated from them and the reasons for their failure is still not clear. 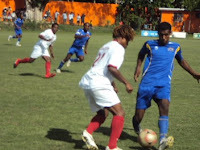 Vanuafoot received reports from Tafea camp side yesterday that there were some internal issues that have affected their performance, and that is something they will have to sort out amongst them. 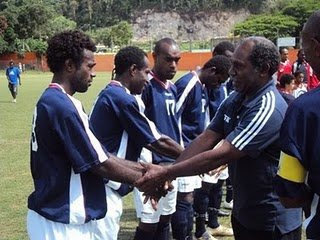 Vanuatu Football Federation officials have sent a message to Tafea boys to keep their heads up no matter the loss. Meanwhile, the other O-league match today between Lautoka and Marist, the Fijian’s have made an impressive 3 – 0 victory over Marist and claim top position over Tafea F.C. in Group B.
Auckland City have picked up a vital away win against AS Manu Ura at Stade Paea in Tahiti today to go five points clear of Waitakere United in Group A of the 2010 O-League. Meanwhile, Group B has been thrown wide open with Hekari United stunning Tafea FC 4-0 at PMRL stadium in Port Moresby. Solomon Islands import Alick Maemae scored a brace while Tuimasi Manuca and Joachim Waroi also chipped in for a comprehensive victory. Hekari now lead the Vanuatu club champions with a superior goal differential but Lautoka, just one point behind, could claim the advantage if they beat a winless Marist FC in Fiji tomorrow afternoon. In the other match, goals to Ian Hogg and Daniel Koprivcic were enough for the defending champions Auckland City to secure maximum points and keep the pressure on cross-town rivals Waitakere who face New Caledonia’s AS Magenta in their fourth round match at Fred Taylor Park next weekend. Paul Posa says it took time to break down a committed home side. After a goalless first half, Hogg put the visitors ahead in the 63rd minute with the defender having a rare one on one opportunity against the goalkeeper and making no mistake. Koprivcic made it two in the 89th minute combining well with Jason Hayne before rounding the goalkeeper and slotting home from an acute angle. With two rounds to go before the home and away final decides OFC’s representative at the FIFA Club World Cup, Auckland City are well placed to finish top of Group A but still have Waitakere to contend with on 27 March at Kiwitea Street. Tafea F.C. Vs Hekari United F.C. Live Now! Refresh your browser every 15 minutes for match update. Hekari scored another goal - Hekari 3 - 0 Tafea F.C. Final score: Hekari United F.C. 4 - 0 Tafea United F.C. Amicale F.C. Vs Tupuji Imere F.C - Live Now! 13.15. Game starts and Tony Chilia got injured and carried out on a stretcher. Free kick by Tupuji and wide shot. Tony got back in. 13.17. Good shot by Tupuji but saved by Amicale Keeper. Another break through by Tupuji but shot was defelected by keeper and cleared out by Amicale defence. 3.20 Error made by Amicale defence and an advantage for Tupuji to score but was saved by keeper. 3.21 Amicale missed a left crossing by Kidston. Tupuji missed a right corner crossing. 3.23 Amicale's Yalu has a chance before the keeper, but shot was saved by Tupuji keeper. 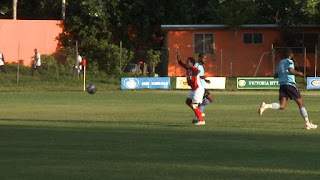 hand-ball at Amicale's defence, shot over bar. 3.25 Another shot by Amicale's 12 jersey and it got wide and out. 3.26 Foul by Tupuji's 26, shot taken by Kidston and it got saved by Tupuji keeper, Chikau Malsale. 3.29 Perfect pass by Batram to Fenedy and he chipped the ball over Chikau Malsale and in the net. First goal for Amicale. 3.33. Foul to Batram but was dismissed by the referee. 3.34 Foul by Amicale's 12 Jersey to Tony Chilia. Free kick awarded and Tony Chilia got a yellow card for swearing. 3.36 Corner shot taken by Batram but was cleared by Tupuji defence. 3.38 Free kick for Tupuji 20m but was cleared out and almost shot back in. It was saved by Amicale keeper. 3.41 Kidston with the keeper but missed. Free kick by Tupuji 's 13 jersey 20m from Amicale box went over the cross bar. 3.43 Fenedy got a chance but missed to score. Another chance for Amicale, when a good pass from Fenedy to Batram 5m away from Tupuji's box and Batram managed to bypass the Tupuji's defence but he shot over the bar. 3.49 Tupuji 8 jersey got red card for using foul language against the referee, and it was disputed by Chikau Malsale, Tupuji keeper. Chikau got a yellow card for arguing with the referee. 3.53 A shot by Batram but was saved by Chikau Malsale. 3.54 44" Billy Kidston scored again for Amicale. 3.57 Tony Chilia trying hard to get through Amicale's defence. Half-time: Amicale F.C. 2 - 0 Tupuji Imere F.C. 46" Batram missed a header from close range. 3" Kidston shot wide 10m from the goal box. 6" Good pass from Fenedy to Kidston but got deflected by Tupuji's defenders. 8" Another shot by Fenedy Mausavakalo was deflected by Tupuji keeper. 12" Replacement by Tupuji Imere. 17" Amicale 31 jersey shot wide. 18" Good chance for Amicale again, but Batram Suri made an error at Tupuji's base. 20" Great shot by Fenedy from Amicale in the Tupuji box and was deflected by captain of Tupuji Imere by hand. Tupuji Captain got red card. Kidston's penalty was deflected by Chikau Malsale. 29" Fenedy scored again for Amicale. 31" Fenedy missed another goal. 35" Amicale's 31 jersey missed an easy goal. 38" Free kick by Tupuji but was deflected by Amicale defender to a corner kick. Corner kick taken, but was deflected by Amicale keeper. Another header from Tupuji was saved by Amicale keeper. 44" Tupuji missed a goal. Final score: Amicale F.C. 3 - 0 Tupuji Imere F.C. In a letter to the President of VASANOC, the Organizing Committee of the 2011 Pacific Games in New Caledonia has confirmed the following sports that will be in the 2011 Games according to Articles 7.4 and 7.5 of the Pacific Games Charter. leading the PVFA table over their predecessor Tafea F.C. F.C. last weekend", said Philimon John, Amicale coach. support to let them come play for my club", he said. The Academy team have moved up the PVFA table after their last match last Saturday against Yatel F.C., and today's match that ended tonight against Seveners United F.C. The PVFA season ended last year with the Academy team at the 8th position and is the last position on the classment. Last Saturday they moved to 5th position and tonight to 4th, pushing Tupuji Imere F.C. down to 5th position on PVFA classment. They toured New Caledonia before football season starts this year, and have remarkably put some performances which count their strength in the PVFA league, and placed them under the spotlight too. Tonight, both teams have some very good opportunities to score and have constructed some good ball work at their opponent's base, but not one was successful in the first half of the match. The game was at Academy's pace, fast and swiftly ball work, but Seveners maintained their grip. In the 2nd half of the game, Academy relief coach, Mr. Wilson August boosted his striking force by replacing his side with upcoming 14 year old star striker, Jean Kaltak. Few minutes past, it was obvious that Jean Kaltak was a threat to Seveners side. Now with colleague Nemani Rogara, the Golden Star football duo were starting to create some uncomfortable scenes for Seveners, and everyone can now predict who to win. Five minutes past half time, a build up game from the Academy side towards Seveners goal box ended with Kaltak's second chance with the ball, and with his great move and magic touch, he made a powerful blow that went past the Seveners keeper with beauty. Minutes past, Seveners almost made an equalizer when a good opportunity from the left was shot skilfully over the Academy keeper, but he got saved by the cross-bar. Again, Jean Kaltak and Nemani had some very good opportunities tonight but have failed to score. Their composition and everyone who contributes to their striking force have done it marvellously. Nemani and Oktap scored the last two goals to end the Academy victory over Seveners. Seveners have also put on a superb game against the Academy, but unfortunately, their loss tonight still placed them at the bottom of PVFA classment with Yatel F.C. and Westan Broncos F.C. Academy have now taken the 4th position with 13 points, Amicale leading with 24, Tafea 20 and Spirit 08 gained 19 points. "Tafea is ready to meet with Hekari this weekend", the statement made by Tafea Captain, Moise Poida when Vanuafoot interviewed the team members during their last training tuesday evening before their departure. The two teams in Pool B have drawn 3 - 3 in their last match and Tafea is now leading their Pool with 7 points. This week, Tafea has gone through some very hard excercises, after their loss to Amicale F.C. by 5 goals to 0 at Port Vila Municipal Stadium last saturday afternoon. The match between Tafea F.C. 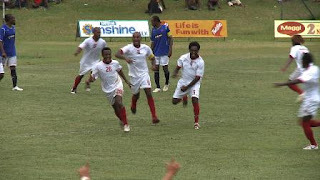 and Amicale was a shock to everyone after Amicale shot 5 leading goals against the Vanuatu club champions. The highest number of goals Tafea got after 14 years they have been dominating football in Vanuatu. "Our loss to Amicale has challenged our fitness and performance and we have now adjusted ourselves and ready meet Hekari United in PNG", said Poida. "We are aiming for a win, or a draw with Hekari will be an advantage to maintain our leading position in our pool", said Poida. "It was an unfortunate moment not to score against Amicale, but we will do our best to score against Hekari United this Saturday", said Tafea F.C. striker, Jean Naprapol. The Vanuatu club champions have left Port Vila yesterday noon for Papua New Guinea and they will play at the PMRL Stadium in Port Moresby on Saturday 13th February 2010, 13.00 hrs.